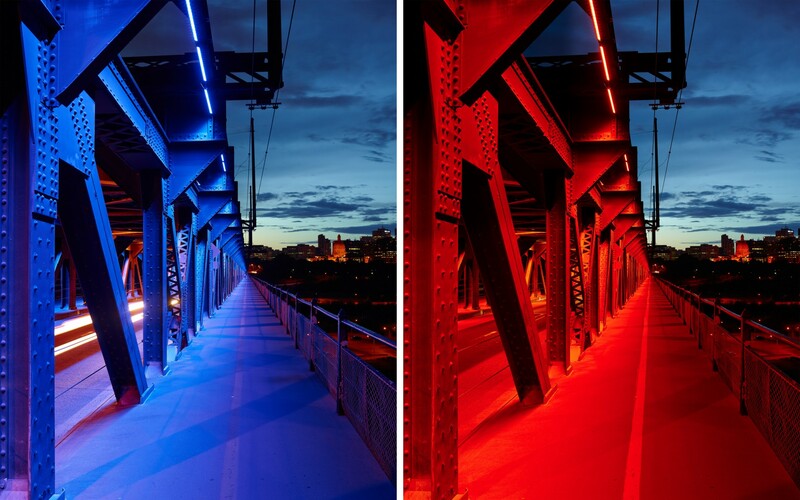 For the first time in its 102-year history, Edmonton’s High Level Bridge has been illuminated. 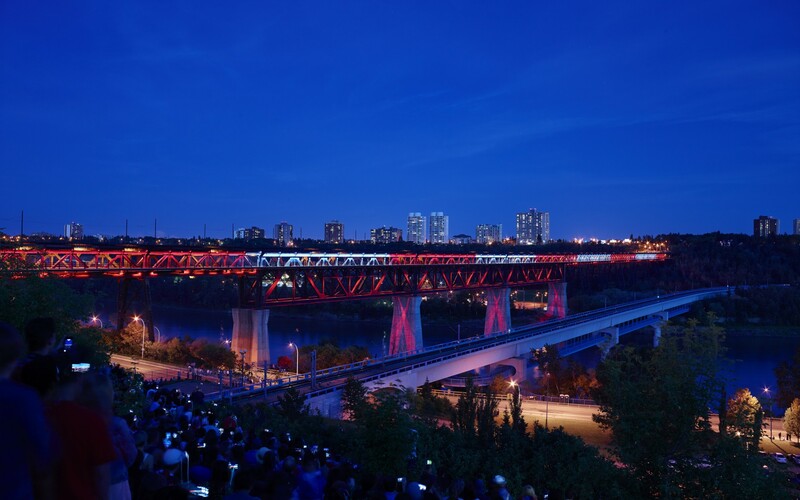 The new lighting system is the result of the “Light the Bridge” fundraising campaign, which generated widespread media coverage and thousands of donations. 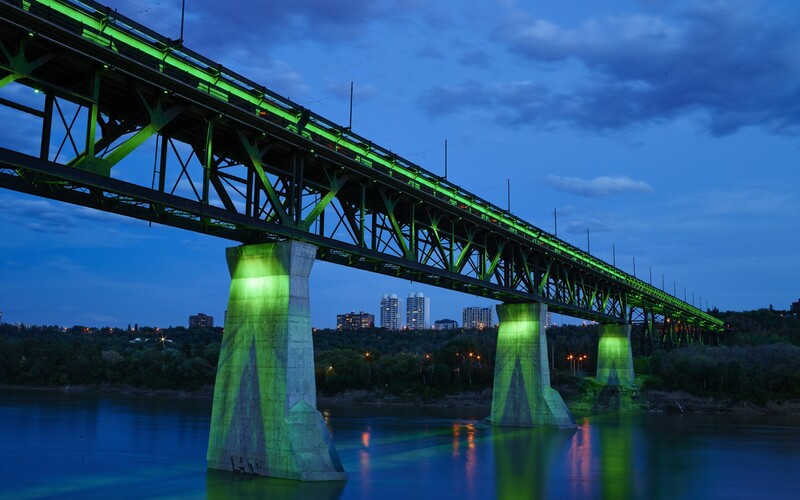 Charged with programming the historic system, Edmonton-based Prolux Lighting decided to emphasize the utilitarian aspects of the multi-functional bridge. The firm used Lumenfacade Color Changing luminaires to wash the beams and cross beams above and along the pedestrian walkway. To avoid penetrating the historic structure, the luminaires were clamped onto mounting locations above the walkway. 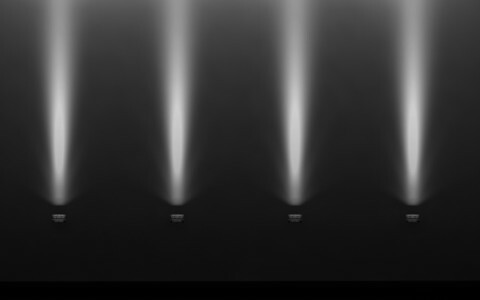 The luminaires create a continuous, mile-long veil of light. Lumenbeam Grande and Lumenbeam Large Color Changing luminaires were then used to illuminate the underside of the walkway. 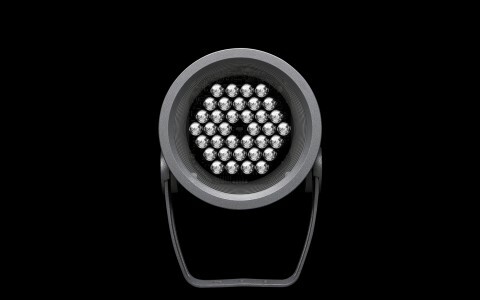 Spaced at precise locations, the luminaires use narrow spread lens optics to emphasize beams and cross members. 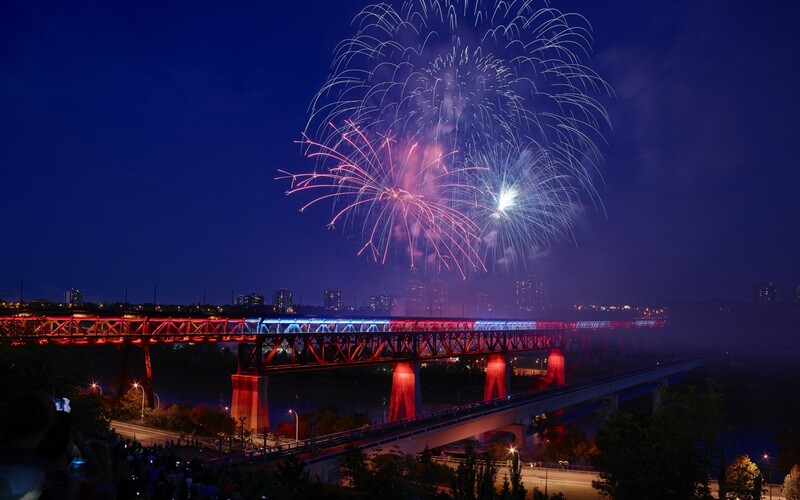 Including the Canada Day unveiling of the newly lit High Level Bridge. 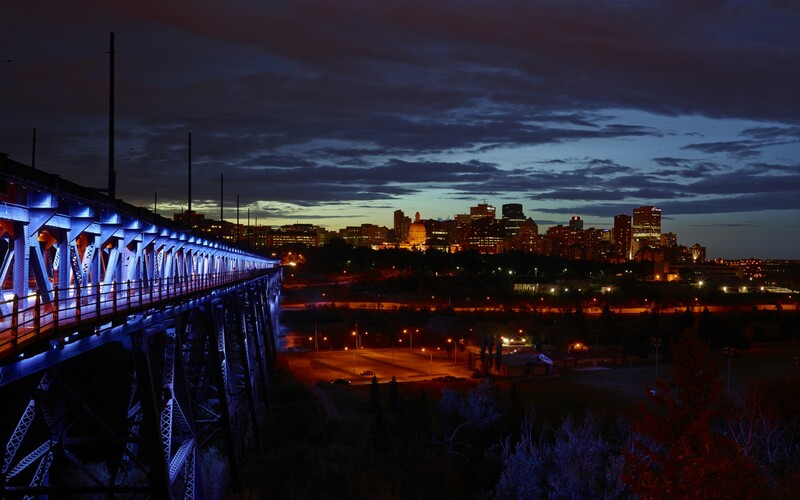 Prolux Lighting used Lumenpulse luminaires to illuminate Edmonton's High Level Bridge for the first time. 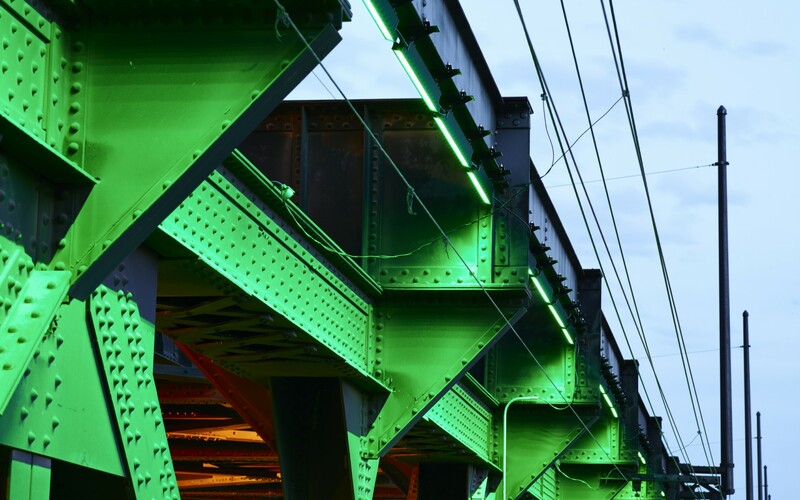 The LED lighting scheme has re-energized the 102-year-old bridge, which now sits proudly among the city's nighttime skyline. Lumenpulse has a long history of lighting these types of structures. They understand the climate challenges in a Canadian city like Edmonton, and they know how to handle the vibration rating for a busy bridge like this. 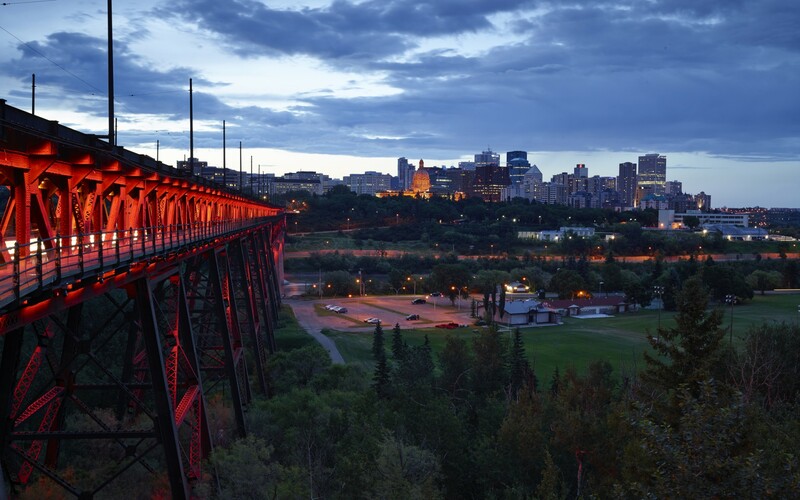 Since 1912, the High Level Bridge has been a presence in daily Edmonton life, linking the city's north and south sides. The 777-meter long bridge, however, had never been lit, which meant every night, the iconic structure vanished from the skyline. To give it the pride of place it deserved among the night sky, the "Light the Bridge" fundraising campaign was launched in 2013. Quickly capturing the public imagination, the campaign generated widespread media coverage and community engagement, with individual and corporate donations totalling over $2.5 million. 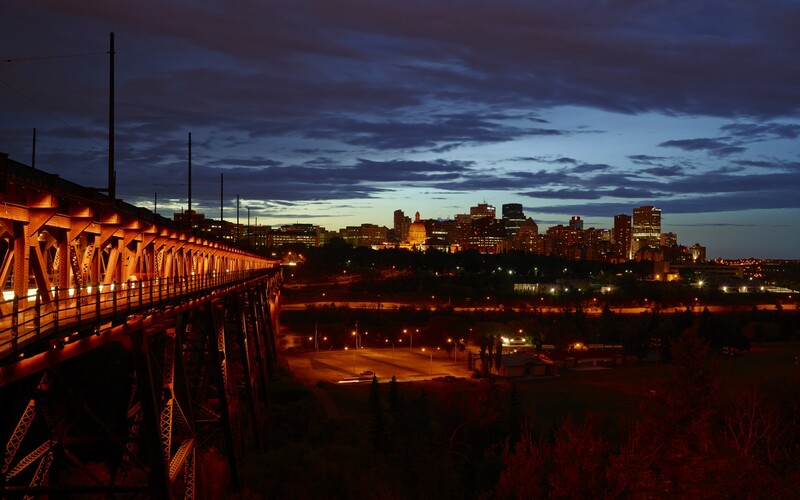 Edmonton-based Prolux Lighting was charged with programming this historic lighting system. "The High Level Bridge is our biggest landmark, but because it was always in the dark, it was black and dreary looking. It didn't have a very proud image. 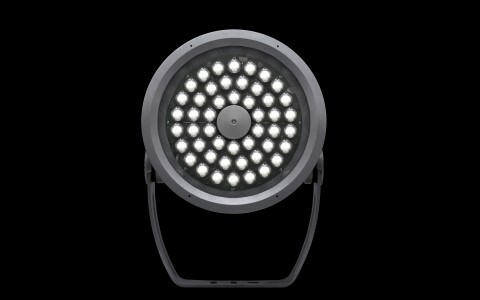 We wanted to change that," said Derek Pogany, principal at Prolux Lighting. "Our goal was to find a balance between looks and budget, all while paying tribute to the bridge and its significance to the city," he said, adding that Lumenpulse was an ideal partner. 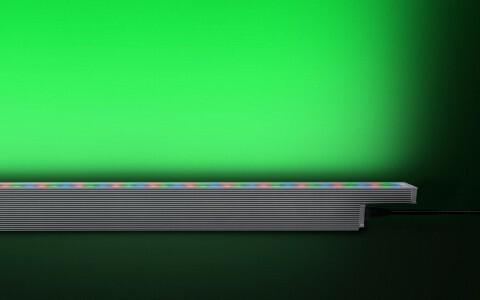 "Lumenpulse has a long history of lighting these types of structures. 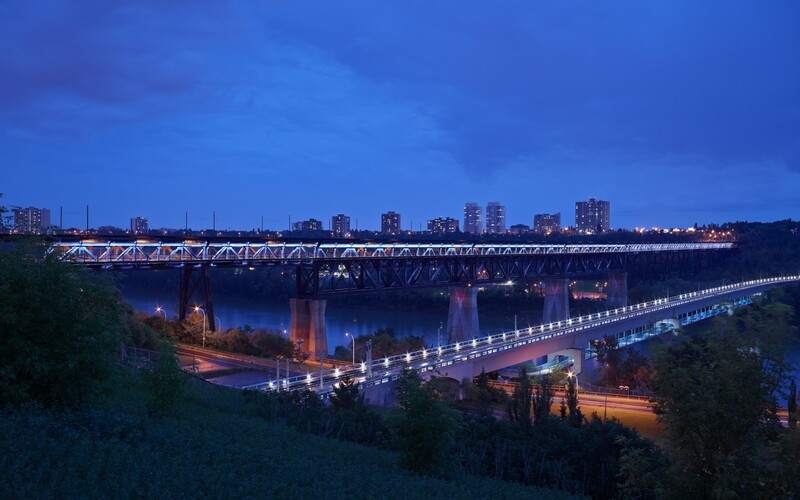 They understand the climate challenges in a Canadian city like Edmonton, and they know how to handle the vibration rating for a busy bridge like this," he said. Prolux decided to emphasize the utilitarian aspects of the workhorse bridge, which at one time accommodated rail, streetcar, automobile and pedestrian traffic. "The bridge has different pieces and sizes of steel, with huge rivets. We wanted to bring those out, to really accentuate the details in the rivets, cross beams and intersections of metal," Pogany said. 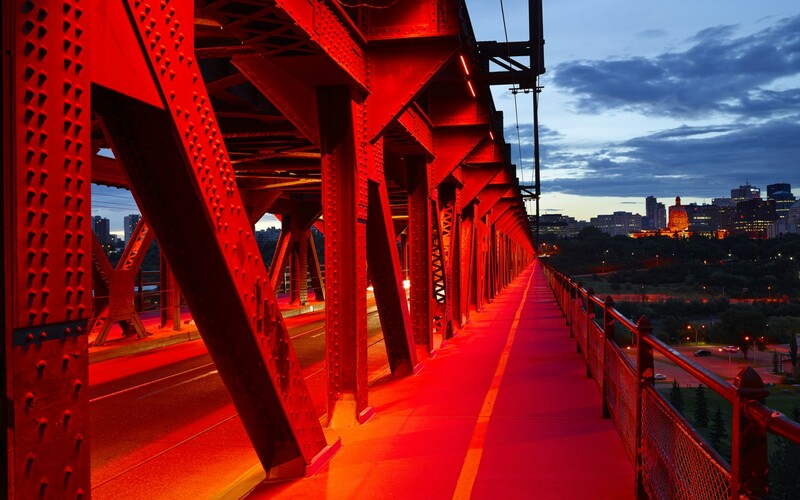 The multi-level bridge, however, posed a number of challenges, providing little in the way of reflectance or solid surfaces that could be lit from a distance. To overcome this, the firm used Lumenfacade Color Changing luminaires to wash the structure's beams and cross beams above and along the pedestrian walkway. "The idea was to get in close, so that we can get as much light on the steel, to really make it pop out," Pogany said. To avoid penetrating or welding the historic structure, the luminaires were clamped into mounting locations above the walkway (and out of public reach, to safeguard against vandalism), creating a continuous, mile-long veil of light. Lumenbeam Grande and Lumenbeam Large Color Changing luminaires were then used to illuminate the underside of the walkway. Spaced at precise locations along the bridge, the luminaires use narrow spread lens optics to emphasize beams and cross members in a similar "veil" of light. 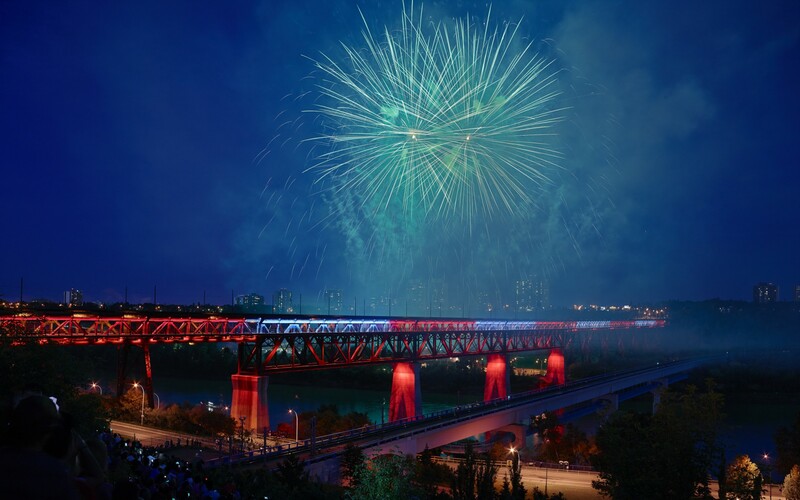 Fully dimmable, the luminaires can be programmed to change intensity and color throughout the night, allowing the city to change the look of the bridge during special events, including the structure's recent Canada Day inauguration. "Everything above the bridge deck is solid and continuous, which contrasts nicely with the underside's focus on intersecting metal and beam. Some elements are in shadow, while others are brighter and more visible. This gives a lot of texture to the bridge," said Pogany, adding that the design's benefits extend far beyond simple aesthetics. "The lighting above the pedestrian walkway also helps light the sidewalks and the paths below it, making the pathway much nicer and safer," he said. The end result highlights the bridge's continued importance to the city and pays tribute to its past. "The whole area is warmer and friendlier, and more unified. It really harkens back to the bridge's original purpose: to tie two cities together and create one."